A corps member simply identifed as Esi Uwakwe was recently slapped by a police officer in Kaura Namoda in Zamfara state. According to reports, Esi is a corps member serving as a teacher at Nasara Standard Academy, Kaura Namoda. He had reportedly punished one of his female students who had erred by asking her to crawl, causing her to sustain serious bruises on her knees. The father of the student got wind of it and invited the police to arrest Esi, who was then slapped by one of the police officers. 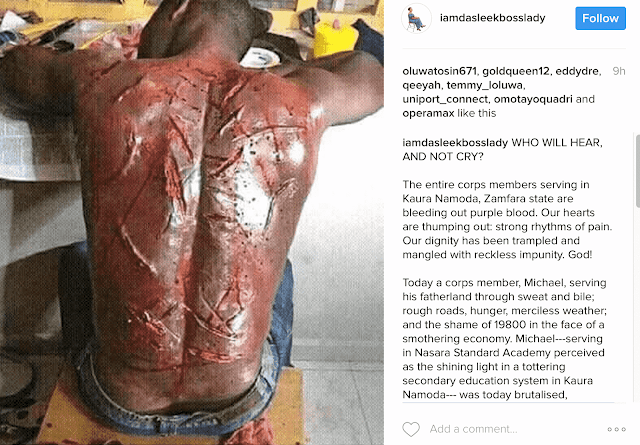 This act sparked outrage amongst corp members who demanded justice. And now, authorities of the National Youth Service Corps NYSC, have reacted. Read their statement below. The attention of the NYSC Management has been drawn to stories making the rounds about the beating of a Corps member, Esi Uwakwe, serving in Kaura Namoda, Zamfara State, by the police purportedly at the instance of an influential indigene of the area. Management wishes to inform the public that findings of investigation launched by the Scheme show that the facts of the case were grossly exaggerated, especially in the social media. Our findings showed that the Corps member, who is serving in a school, went beyond his responsibility of teaching and adoption of acceptable approaches to discipline by causing knee injuries to one of his students whom he instructed to crawl on his knees. The angered father of the student took the matter to the police and in the course of handling the case, an overzealous officer slapped the Corps member. Our position on the matter is that both the Corps member and the policeman were wrong in their approaches. However, we are pleased to note the step taken by the Zamfara State Commissioner of Police, who invited all parties to his office for amicable resolution of the case. WHO WILL HEAR, AND NOT CRY?The entire corps members serving in Kaura Namoda, Zamfara state are bleeding out purple blood. Our hearts are thumping out: strong rhythms of pain. Our dignity has been trampled and mangled with reckless impunity. God!Today a corps member, Michael, serving his fatherland through sweat and bile; rough roads, hunger, merciless weather; and the shame of 19800 in the face of a smothering economy. Michael---serving in Nasara Standard Academy perceived as the shining light in a tottering secondary education system in Kaura Namoda--- was today brutalised, manhandled and reduced to nothingness by a brainless team comprising of the richest man in Kaura Namoda and his equally wanton boys. What was his crime?Michael had punished his student who happens to be this man's ward. A simple kneel down. Michael who had nurtured these block heads with patience and love. Michael, who had taught with empty stomach till letters on the chalkboard danced like rampant music notes before his eyes. For all of us like Michael, who have stretched the capacities of our strengths and sensibilities to serve a stifling system. For all the ' under the sun and in the rain', what have we gotten as reward?This notorious man, clenching his cash ridden fists, recruits the help of the police and in that shameless trotting of Zombies, storms Nasara Academy to crucify Michael like a criminal. He was punched like a sack of millet and stripped of humanity. He was beaten, beaten, and again beaten like he stole karats of gold in a jungle market. O God! My fingers are itching, and it's like they will drip blood. Michael was driven to the Police Station where the real torture awaited him. They removed what was left of his pride as a Man serving his country. Then, they flogged and flogged him, and when their energy sapped out, the Evil of a man threw wads of naira notes about, and refueled their animalism. Michael was a heap of sorrow and a container of hot painful tears. As some of Michael's colleagues arrived and tried to raise their voices against the escalating reign of heartlessness; the Police men, some apparently drunk, threatened with pointed rifles, slapping.